Appended after my own overview below is a focused and insightful posting by Fred Friend: As RCUK re-thinks its policy draft, and makes the requisite corrections to ensure that all papers are deposited in an OA repository (Green OA), RCUK should on no account emulate the Wellcome Trust's policy of (1) paying publishers to deposit in the (2) Europe (formerly UK) PubMed Central Repository. (1) The parties bound by an RCUK OA mandate are RCUK fundees, not publishers. 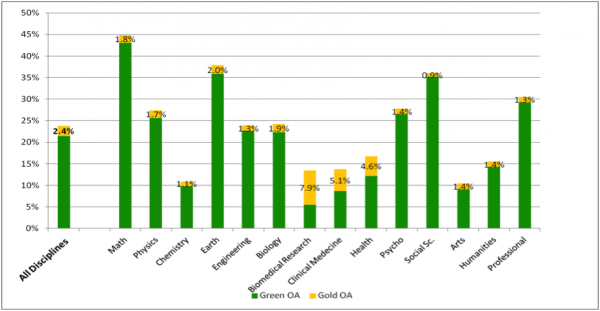 Deposit itself (Green OA) should be a requirement, as a condition of RCUK funding, to be performed by the fundee, not something extra (Gold OA), to be paid extra for, and performed by, a 3rd party, the publisher. In other words, deposit is self-archiving, by the funded. Moreover, verification of fundee compliance with the RCUK Green OA requirement can and should be focused on the fundee, not on a 3rd party that is not bound to comply with RCUK funding conditions, but simply paid for a product. The incoherence of the present RCUK OA policy - a direct legacy of the Wellcome policy that RCUK is obviously using as its model -- is, as usual, the result of conflating Gold and Green OA, and putting all the emphasis on Gold OA. This policy definitely has not been an unmitigated success for the Wellcome Trust and is certainly not scalable to all of UK research, for all the reasons Fred mentions below (and many more besides). The Wellcome model should not be imitated by RCUK. (2) Europe (formerly UK) PubMed Central (EPMC) is an OA collection of European biomedical articles. That's fine. Let there be many such OA subject collections, in many fields, and also global collections, across multiple fields, and across multiple countries. But such collections should on no account be the locus of direct deposit for authors complying with RCUK (or EU or US or individual institutions') self-archiving mandates. The locus of deposit for complying -- once, and only once -- with either funder or institutional OA mandates should be the author's own institutional OA repository, from which central and global collections can then harvest. This engages institutions in monitoring and ensuring the compliance of their own researchers with both funder and institutional OA self-archiving mandates (Green OA), and it keeps publishers (and publisher payment for Gold OA, a separate matter) out of the loop. To understand the dynamics, remember that no one deposits anything directly in Google: Google (and Yahoo, etc.) harvest from local websites. That's exactly the way it needs to be for central subject-based or country-based OA collections too, for the sake of compliance-verification by the RCUK fundee's institution and funder and to ensure that authors only ever have to self-archive their papers once: institutional deposit, automatically harvestable by (multiple) central collections (e.g. EPMC). I wonder whose idea this was! I can make one or two guesses, but whoever suggested it, it is a bad idea! I welcomed the development of UK PubMed Central, until the point when Wellcome Trust started to pay some publishers to make the deposit on behalf of authors and funders. I do not know whether Wellcome will disclose the sums paid to publishers, but my impression is that whatever is being paid more than covers the cost of making the deposit and is in effect a payment to publishers for open access and re-use rights. When people I know who are not in academia ask me about my work and I explain that I am working for open access to taxpayer-funded research, this is welcomed by whoever I am speaking to – until I say that many publishers are asking to be paid by taxpayers for making articles open access, at which point the welcome from my listener turns to incredulity. Even more incredulity if I mention the level of payments being requested for APCs. So, if RCUK were to go down the road of paying publishers to deposit in Europe PubMed Central, they should be prepared for challenges on such a mis-use of public money, especially if the deposit payment were to be in addition to the payment of an APC. Presumably the existing funders of UKPMC – some of them charities – would also expect a contribution from the non-biomedical RCs towards the high cost of running Europe PMC. This “idea” could cost a lot of money. I suspect that there will also be objections from subject groups who see their repository needs as being very different from those of the biomedical community. How many times in my long career have I heard that other such all-embracing proposals will not work for subject x or y! UKPMC is a wonderful service for the biomedical community, a service for which they are prepared to pay and have the resources to pay, but its design will not fit all subjects without major modification. Already I hear some concern about the undue influence of the biomedical community and Wellcome in particular upon the Finch Report and thus upon Government policy. The suspicion is that the open access policy of the Wellcome Trust, which works very well for the Trust and for the biomedical community, is being adopted for all UK research outputs without consideration of the way the Trust’s open access decisions can be applied within other very different academic structures. RCUK: please think again! It is good that you are considering mandatory repository deposit, but there are other repositories which can provide better value for the service you need. Finch on Green: "The [Green OA] policies of neither research funders nor universities themselves have yet had a major effect in ensuring that researchers make their publications accessible in institutional repositories… [so] the infrastructure of subject and institutional repositories should [instead] be developed [to] play a valuable role complementary to formal publishing, particularly in providing access to research data and to grey literature, and in digital preservation [no mention of Green OA]…"
Björk B-C, Welling P, Laakso M, Majlender P, Hedlund T, et al. (2010) Open Access to the Scientific Journal Literature: Situation 2009. PLoS ONE 5(6): e11273. Harnad, S. (2007) The Green Road to Open Access: A Leveraged Transition. In: Anna Gacs. The Culture of Periodicals from the Perspective of the Electronic Age L'Harmattan. 99-106. Hitchcock, Steve (2012) The effect of open access and downloads ('hits') on citation impact: a bibliography of studies. Houghton, J.W., Rasmussen, B., Sheehan, P.J., Oppenheim, C., Morris, A., Creaser, C., Greenwood, H., Summers, M. and Gourlay, A. (2009). Economic Implications of Alternative Scholarly Publishing Models: Exploring the Costs and Benefits, London and Bristol: The Joint Information Systems Committee (JISC). Van Noorden, Richard (2012) Britain aims for broad open access. Nature News 19 January 2012. Comments invited -- but please don't post them here but in the Higher EDucation Development Association (HEDDA) blog. "Assuming the article is in the biomedical field, can authors simultaneously put a copy of their manuscript in their institution’s repository, and upload it to PMC through the NIHMS? Or does the article have to be funded by the NIH for them to do this?… The reason I ask question #2 is that I am wondering if just putting a manuscript [in]to an IR is enough to truly make the article visible and accessible. Just because something’s on the web doesn’t mean it will be found. Just because something’s indexed by Google doesn’t mean it will have high rank in their search results. Putting a manuscript on PMC, through NIHMS or other channels, means that it would be indexed in PubMed, which would make it more accessible." This an extremely important practical issue, and at the moment it is not being properly implemented. The short answer is, yes, a document deposited in the author's institutional repository (IR) can be uploaded to PMC through NIHMS, regardless of whether NIH has funded the research (and, a fortiori, regardless of whether NIH has funded extra "gold" OA publication fees). But those extra author self-archiving steps should not be necessary! The reason it became apparent that green OA self-archiving mandates (from both institutions and funders) would be necessary was that spontaneous, unmandated self-archiving rates remain low (about 20%), even when recommended or encouraged by institutions and funders. That's why the first NIH OA policy, a request, failed until it was upgraded to a requirement. But the practical implementation of the NIH mandate was still short-sighted: It required direct deposit in PMC, and allowed this to be done by either the author or the publisher. The result was not only (1) uncertainty about who needed to deposit what, when, not only (2) a partial reliance on a 3rd party other than the fundee, not bound by the grant, namely, the publisher, to fulfill the conditions of a grant to the fundee, but it also (3) imposed a double burden on fundees if their own institutions were to mandate self-archiving too: They had to deposit in their own IRs and also in PMC. This did not help either with encouraging more institutions to adopt self-archiving mandates (even though institutions are the universal providers of all research, funded and unfunded, across all disciplines) nor with encouraging authors, already sluggish about self-archiving at all, to comply with self-archiving mandates (since they might be faced with having to deposit the same paper many times). Yet in reality, the problem is merely a formal one, not a technical one. Software (e.g., SWORD) can import and export the contents of one repository to another automatically. More important: There is no need for institutional authors ever to have to self-archive directly in an institution-external (central) repository like PMC: The contents of IRs are all OAI-compliant and harvestable automatically by whatever central repositories might want them. So institutional and funder mandates need to be collaborative and convergent, not competitive and divergent, as some (including NIH's) are now. And the convergence needs to be on institution-internal deposit, followed by central harvesting (e.g. to PMC) where desired -- certainly not the reverse. Anonymous FTP archives. Arxiv (1991) was an invaluable milestone on the road to Open Access. But it was not the first free research-sharing site: That began in the 1970's with the internet itself, with authors making their papers freely accessible to all users net-wide by self-archiving them in their own local institutional "anonymous FTP archives." Distributed local websites. With the creation of the world wide web in 1990, HTTP began replacing FTP sites for the self-archiving of papers on authors' institutional websites. FTP and HTTP sites were mostly local and distributed, but accessible free for all, webwide. Arxiv was the first important central HTTP site for research self-archiving, with physicists webwide all depositing their papers in one central locus (first hosted at Los Alamos). Arxiv's remarkable growth and success were due to both its timeliness and the fact that it had emerged from a widespread practice among high energy physicists that had already predated the web, namely, to share hard copies of their papers before publication by mailing them to central preprint distribution sites such as SLAC and CERN. Central harvesting and search. At the same time, while physicists were taking to central self-archiving, in other disciplines (particularly computer science), distributed self-archiving continued to grow. Later web developments, notably google and webwide harvesting and search engines, continued to make distributed self-archiving more and more powerful and attractive. Meanwhile, under the stimulus of Arxiv itself, the Open Archives Initiative (OAI) was created in 1999 -- a metadata-harvesting protocol that made all distributed OAI-compliant websites interoperable, as if their distributed local contents were all in one global, searchable archive. No need for direct central deposit in google! Together, google and OAI probably marked the end of the need for central archives. The cost and effort can instead be distributed across institutions, with all the essential search and retrieval functionality provided by automated central "overlay" services for harvesting, indexing, search and retrieval (e.g., OAIster, Scirus, Base and Google Scholar). Arxiv continues to flourish, because two decades of invaluable service to the physics community has several generations of users deeply committed to it. But no other dedicated central archive has arisen since. Like computer scientists, whose local, distributed self-archiving is harvested centrally by Citeseerx, economists, for example, self-archive institutionally, with central harvesting by RepEc. Mandating self-archiving. In biomedicine, PubMed Central looks to be an exception, with direct central depositing rather than local. But PubMed Central was not a direct author initiative, like anonymous FTP, author websites or Arxiv. It was designed by NLM, deposit was mandated by NIH, and deposit is done not only by authors but by publishers. Institutions are the universal research providers. Open Access is still growing far more slowly than it might, and one of the factors holding it back might be notional conflicts between institutional and central archiving. It is clear that Open Access self-archiving will have to be universally mandated, if all disciplines are to enjoy its benefits (maximized research access, uptake, usage and impact, minimized costs). The universal providers of all research paper output, funded and unfunded, are the world's universities and research institutions, distributed globally across all scholarly and scientific disciplines, all languages, and all national boundaries. Deposit institutionally, harvest centrally. Hence funder self-archiving mandates like NIH's and institutional self-archiving mandates like Harvard's need to join forces to reinforce one another rather than to complete for the same papers, and the most natural, efficient and economical way to do this is for both institutiions and funders to mandate that all self-archivingshould be done locally, in the author's institutional OAI-compliant repository. The contents of the institutional repositories can then be harvested automatically by central OAI-compliant repositories such as PubMed Central (as well as by google and other central harvesters) for global indexing and search.